Innovative octagonal dimples for outstanding compressive strength. One sheet for drainage, water storage, and filtration. Easy and quick to lay out straight from the roll. 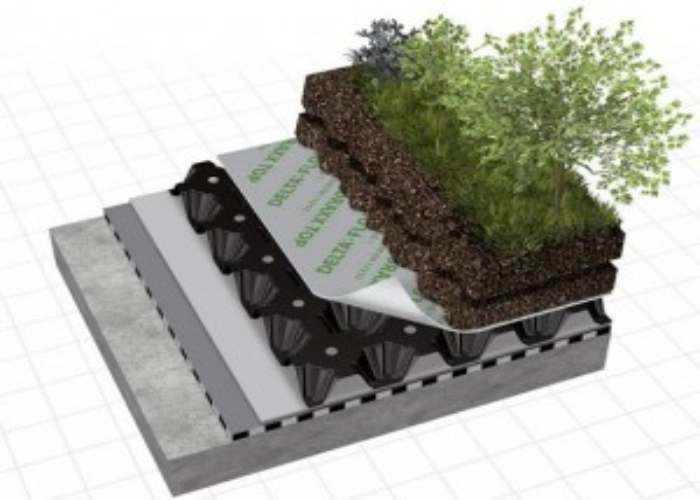 Offers high drainage capacity for green roofs. Features the outstanding compressive strength of 200 kN/m² and an enlarged water retention capacity thanks to its innovative 20-mm high octagonal dimples. Eliminates an entire laying operation because of its integrated geotextile, on which substrate can be spread immediately after the sheet has been rolled out. Forms a consistent homogenous surface without the problems caused by loose cloth layers slipping, shifting, or being blown about by the wind. Is capable of retaining 7 l/m² of water as a reserve for periods of draught. May also be used on green inverted roofs because it is breathable (S value: c.0.4 m). Is CE conformable as per DIN EN 13252 and meets the requirements of the FLL guideline for green roofs. May be easily and safely joined with the enclosed Delta Florexx connecting elements.